My name is Mariah Wilder, and I am from occupied Dakota land in Minnetonka, MN. My maternal grandparents are Dutch, from the Netherlands, and my paternal grandparents are English and Scottish. On September 3rd, I walked around the Hiawatha Encampment to visit with people and collect stories. I had been watching the camp pop up throughout the month of August because it was along my morning commute. On a day when some people in North America were celebrating Labor Day, I was face to face with the disparities that exist in our labor force. And I thought, how fitting it would be to collect and document on this day. Because if the first Labor Day was birthed out of a strike against mistreatment or injustice, it would be only be right to continue the strike by exposing some of the darkness that still looms in our midst. I wanted to point out: we really haven’t come that far if the Natives of this land have been forgotten. The Wall of Forgotten Natives is one name you will hear for the camp. One of the questions I asked people that day was how they felt about the name, and the ones who shared with me really resonated with it. Before I went, I searched online for information, and one article title caught my attention: The Emergency is Now Visible (Jessica Lee, MinnPost). It’s so true. The issue of housing, and the lack of access that people in certain populations have to housing, is not anything new. People started congregating out of need for community and safety. I began asking people in my circles what they knew of the camp, and many had never even heard of it - some had seen it but didn’t know anything about it. If you have been curious yourself, I would like to direct you to www.franklinhiawathacamp.org for further information. This website was created by a consortium of Native American organizations who are collaborating to address the systemic issues existing within the camp. Because it is a grassroots, indigenous-led movement, I find the information to be more trustworthy than what you might find from outside sources. Regardless of the positive action, at the end of the day, I felt there was not enough awareness about the realities along this wall. As a photojournalist who was born into whiteness, I tread very lightly when I set out to document socio-economic issues, especially those that are blatantly intertwined with racial and ethnic divides. I ask myself a series of questions, like, "Will these photos bring about more good, or will they harm?" "Will the process of me taking these photos in any way jeopardize another human being’s safety, dignity, or voice?" "Will I be partaking in colonization – the stealing of space, energy, or culture?" It is brutal when outsiders come in with any agenda… so I stepped into the camp with just an idea, and wanted to ask folks there what they needed, and how they felt about me being there. Before I share the stories that unfolded, I want to start by challenging you. Especially if you are a fellow white-minded or white-skinned person, I want to challenge you to surrender your plan to "help" – no matter how well-intentioned you are, helping hurts all too often. Surrender also your need to stay comfortable. I have had to come face to face with the ugliness of my role in the system of whiteness, and have to choose to sit in that discomfort and not flee from acknowledging it. In moments when I felt attacked for my whiteness, I realized that this is only a glimpse of what non-white folks feel on a daily basis - so to insist on remaining in what feels safe, would be to contribute to a system that divides and takes power, a mentality that allows us to remain ignorant. Yes, I’m talking about white privilege. The privilege to flee when we feel uncomfortable, for example. Being uncomfortable can be one of the richest opportunities to grow, so long as we do not pursue discomfort itself for the benefit of personal growth. Such ends would make humans just the means to it - in other words, your personal feel-good-that-I-did-good could only come at the expense of others. What we pursue should be mutual healing and liberation. Lilla Watson, an Aboriginal elder and activist from Australia, said it best: "If you have come here to help me, you are wasting your time. But if you have come because your liberation is bound up with mine, then let us work together" (Lilla Watson). *Verbal consent has been given by the following persons to share their name, story, and photo publicly. ﻿Right away, someone in the NAH tent introduced me to Mo, "Mo loves having his photo taken, you can talk to him, he’ll probably share his story." So I walked with Mo the length of the sidewalk, until we reached his place. “They call it the bike shop,” he told me. Bicycle tires, frames, and spokes were strewn around the outside of his tent. He said that he and his buddy started repairing people’s bikes and now everyone brings their bikes to him. I asked where everyone got their tents from. He said a lot of churches have donated tents. "What brought you to the camp?" "I’m on the waiting list for a treatment center in MN." Mo, who is Navaho-Mexican mixed, grew up in the Twin Cities. He went to North High School, got his GED at Emerson High, and is now a certified electrician. He used to be a technician for Comcast. On the side, he owned his own landscaping business. "My supervisor was the one who gave me meth for the first time. I owned a business, I owned my own home," but then his boss encouraged him to use, his house foreclosed, and he lost custody of his kids. Referring to his partner at the time, "She didn’t want to be around me, I didn’t even wanna be with myself. That’s when I knew I needed help." "Yeah they provide all the necessities. Safe, clean needles, alcohol pads… But they’re not the ones helping with the waiting lists for treatment." In the later part of his story I discovered that he has a case worker at St. Stevens who is helping with this process. "What's your dream?" I asked. "Don't even know yet. Back then it was bigger business… In landscaping and concrete. Now it's a matter of having the desire to get there.” After hearing his story, I asked if I could take his portrait, thanked him for sharing, and continued walking down the sidewalk. There was a family sitting tucked back behind the tents, under the trees, who smiled at me when I passed, so I motioned the question, "Can I approach you?" The woman who led the invitation and conversation was so friendly. Her name is Maggie Thunder Hawk. When I told her what brought me here, she said, "I’ve been wanting to share my story but I didn’t know how to or who would listen." When I asked if she wanted me to use a pseudo name for her in publication, she said, “No, I want people to know I’m here. I want my family and everyone to know." This I found to be very rare, as most people in the camp want to keep private. Maggie was born and raised on Pine Ridge, South Dakota. Her father is from Leech Lake. She is mother to four and grandmother to three, with one on the way. Her daughter who is pregnant is living at the camp, along with many other family members that she introduced me to. "What do you want people to know about all of this?" "People should realize there's a lot of homelessness in MN." When I asked Maggie how she came to be in a homeless situation, she was very open. Her family lost their home eleven years ago. Her older kids were truant, which was a matter that eventually involved the police. Then it all suddenly spiraled. One officer made accusations about her family and home, took her younger kids away from her, left tickets for trespassing, and then she could no longer be on Little Earth property. "The judge wanted to know why I had so many trespassing charges and when I told the judge about the officer, the charges were dropped and the judge told the cops to stop bothering me." But at this point Maggie had already been without a home for two years. She began re-immersing herself into the community through service projects in Little Earth. She tried to get an apprenticeship there but every time she would follow up, the social services had not kept clean records and made her reapply each time. This was also the case for fighting for Section 8 housing through HUD. "St. Stevens offered a room for just me, but how can I do that when all my kids are outside?" She spoke to a very critical piece of information to the puzzle of housing in MN. Most homeless shelters will only accommodate individuals; there are only a handful that will take whole families. This is a factor that came up when I spoke with the next family after Maggie, as well. It's really time that we start tearing down some common misconceptions about the multifaceted plight of homelessness. Sadly, I have heard far too many blanket-statements and accusations roll off the tongues of people who have never experienced similar conditions. Questions, people. It's good to ask questions. But be open minded, not condescending. One question may be asked, "Why can't they just stay in a shelter?" vs. asking the person with experience, "How have shelters treated you? What's the process like?" I wanted to ask Maggie these latter questions. "I’ve heard that shelters are actually more risky because some people there can be abusive. What’s it been like for you?" "Shelters are dangerous. You could get killed. And people think it’s free, but you pay your way through shelters. So we stayed with families and friends when we could. We stayed in vacant lots. When it got cold, we would sneak into apartment buildings and stay in the laundry rooms where it’s warm." She then disclosed to me what it’s been like living at the camp. "My brother used to tent here four winters ago. He started this all. But when he would leave, the cops would throw his stuff away. A few months ago, my family was some of the first ones here. Some people who came after us were told by the cops, ‘Go to tent city.’ But it’s bad because majority of people here have homes and are here to party and cause trouble, making it hard for us who are actually homeless." It was fascinating to hear her describe how the camp has been set up: the families with kids are on the lower end and the people needing treatment are on the other end. She expressed concern about children being exposed to drugs and violence. "Fights break out over drugs. Did you hear about the shooting two weeks ago? Some guy was jumped and then started shooting the guys who jumped him." "What are the options for your daughter who is pregnant?" "We don’t know. She just lost her benefits. You can only get welfare for 50 months, and her older son just turned seven years. She had a house over north but couldn’t pay rent." "Do you think there are midwives and other birth support that you could get through Minnesota American Indian Women’s Resource Center?" "I don’t know. But that would be better than hospital bills." "What do you think is going to happen at the end of the month?" "Nobody’s gonna have housing, we’ll still be in the same position we were in." Maggie was happy to have her portrait taken. And her grandkids surrounded me and wanted to try using my camera. It's a favorite life moment for me when I get to put a camera in the hands of a child and show them how to press the shutter. They went crazy on that button, posing for each other and giggling. I continued walking down the sidewalk and a young man approached me. "Would you be able to help me get butane fuel?" He had a mini stove but no gas for it. Thankfully I was carrying some Cub Foods gift cards, as has been my practice since my early days as a street photographer. Years ago I quickly learned that taking someone's portrait can be felt as a type of stealing, because it may benefit me somehow but not that person. I want mutual exchanges, both giving and both taking. So I handed him some cards and asked if I could hear a bit of his story. He was sitting on a crate outside his tent and then pointed inside, introducing me to his wife. "My wife and son live at People Serving People but come here to visit." I knelt down, and just past the smiling woman was a tiny baby, all wrapped up. "He's one month." My mouth dropped in surprise and I was overcome by a heavy feeling. This couple did not want their photo taken, but the information they were willing to share was so valuable. "What do you want people to know about this camp, and the people here?" "Everybody's not here for the same reason. But one big reason is that the Coordinated Housing Assessment (through St. Stevens + Simpson Housing) is so backed up. People who are just now getting housing have been on the waiting list since 2016 or earlier. There's tons of paperwork to do." "What do you think is the solution?" "More funding. St. Paul is rebuilding the Dorothy Day Center to house more low income individuals. But what about Minneapolis?" it was the wife who was speaking so passionately, "I moved here because MN has a reputation for good housing and help for women and children. I was told, 'it only takes 30 days to get housing.' But here I am. People don't know that sometimes sudden crisis causes homelessness. I'm six credits away from having my bachelor's in Physical Therapy." 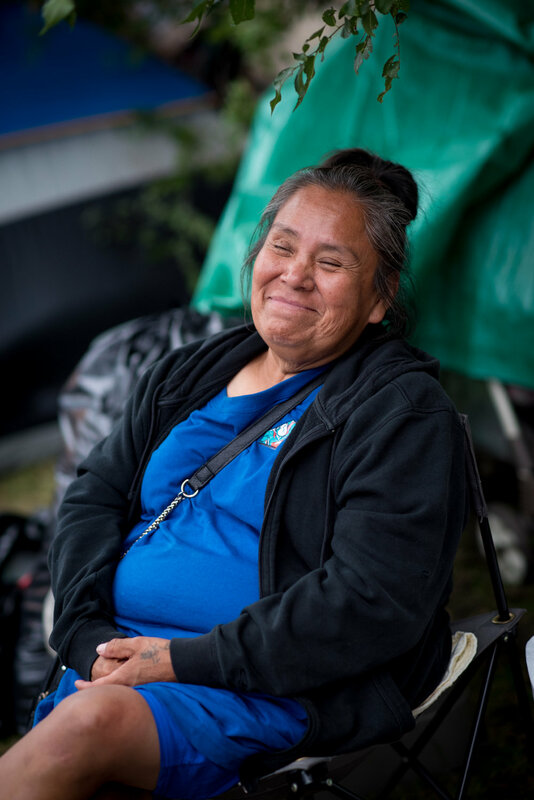 She told me that in order to stay together as a family, in a state that caters emergency options to sole individuals, they would find "floating shelters,” where you stay in one church for a week and move to the next. She expounded on the complexities of the housing system. "The government subsidy (MFIP) goes directly to the landlord. And it's only for the first five years that we'll get this. We need solutions that won't just put a band-aid on the issue. We need employment training, job fairs... We need business minded people to step up and do something!" "What do you think will happen at the end of the month?" "There has to be a better solution. If you forcibly remove people you'll just feed the cycle." A little ways down the sidewalk, my attention was drawn to a tent that had some ceremonial art pieces displayed. On one chair was a decorated bull skull. There was a woman in a wheelchair next to it, and when I introduced myself she did the same, and then shouted for her husband to join us. When I asked about the skull, her husband began spewing cultural history lessons. "These aren't decorations, the bull is sacred. I go to Sundance once a year, and we used to put stakes in us and tie ourselves to the tree of life. That was originally the ceremony when boys become men." I asked him what he thought the solution was for the crisis at hand. "More low income housing. Riverside high rises used to be Native housing before the influx of Somali refugees. I know we need to take care of our refugees, but now we need more housing to take care of our Natives. Little Earth has room for a few more high rises. They need to take out the park. We need to petition. Duluth has more openings than we do right now. When you're on SSI you get $750/month. That's not enough for rent and food. But the shelters aren't good either. The radiators have dirty needles hidden in them and there's MRSA all over. When we were in a shelter we tried to shampoo the carpets but it wouldn't get clean enough - so we put down sheets on the floor. A tent is better than a shelter or motel." "How long have you two been together, and what brought you to the camp?" "We've been married for 24 years. We have 13 kids and 16 grandkids. We've been homeless for 6 years because our kids got lead poisoning in Section 8 housing and we tried to sue them but got kicked out. My kids are allergic to everything and shelters are not sanitary." The wife spoke up, "For me, I'm handicapped, so it's very hard. I've asked for a handicapped bathroom here. When staying in basements of people I would fall up or down the stairs. Getting in and out of a tent is hard." "Do you think it's better that people are congregating in numbers?" "Yeah, we feel safer together. Feel like we're at a Powwow or something. Some people want publicity but some want protection. But what we really need is better distribution of the city's money. A multi-million dollar stadium was just built and we're right here." These are the voices of the forgotten Natives. The fine line I walk on, my friends, is the line that is just past advocacy and just before robbery. Am I making it easier for readers to stay in their comfort zones - because now they can feel connected to Maggie, Mo and the others without having personal engagement - thus robbing both parties of the rich opportunity of uncomfortable growth? Or is it enlightening to the audacious point of paradigm shifts, that will then lead to personal acts of intentionality in crossing cultures and crossing socio-economic disparities? This is not a rhetorical question. Because I can't express to you how powerful it is to sit in the company of people who have generations of deep traumas and systemic oppression at the hands of my people… And as Maggie expends energy to re-tell her story to me, she hands me her fry bread and insists that I take and enjoy. Please don't miss out on moments that can heal, forgive, and liberate.